3rd annual Whisky Jewbilee #Seattle festival bottling revealed! We’re very pleased to announce reveal our festival bottling for our sold out Whisky Jewbilee Seattle 3rd annual event! Only 150 bottles available, and bottled at 56% ABV, this collaborative whisky was distilled, matured, and designed by distillery founder and owner of San Diego Distillery, Trent Tilton (with a little help from us). Flavor wise, this whisky is richly peated with a wonderful deep rich sweetness that is beautifully balanced by a sherry-driven spice and nutty quality. Be sure to stop by the Single Cask Nation​ and San Diego Distillery​ tables to get a taste of this amazing whisky. Sign up at the Single Cask Nation table to get your very own bottling (which can be purchased *after* the event and shipped right to your doorstep). 3rd annual Whisky Jewbilee Seattle SOLD OUT! We’re proud to announce our collaboration with Chicago’s own KOVAL distillery for this year’s Whisky Jewbilee Chicago festival bottling. We’ve long been fans of the distillery and the interesting bottlings that they release (their oat and millet whiskies are among our favorites). This special release bourbon was matured for almost five years in a newly charred 30 gallon cask and is among the oldest bourbons at the distillery. We fell in love with this cask immediately and hope you will too. Bottled at 54.5% alc./109 Proof, 150 bottles are available exclusively to attendees of Whisky Jewbilee Chicago for $85 per bottle. Sign up on the night at the Jewish Whisky Company/Single Cask Nation table to secure your bottle or purchase using the URL we’ll share with all attendees after the conclusion of this year’s Jewbilee. Secure your ticket to Whisky Jewbilee Chicago soon! Welcome to the morning of the SOLD OUT 5th Anniversary Whisky Jewbilee New York City! Our complete pour list can be seen HERE. See you tonight! 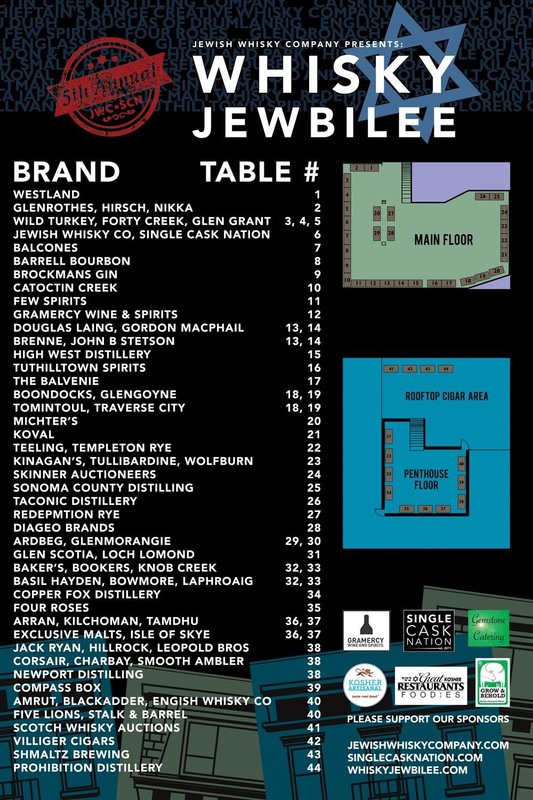 Be sure to stop by the Jewish Whisky Company’s Single Cask Nation table to say hi and maybe taste a whisky or a even a whiskey! Oh, and reserve your bottle of this year’s highly collectable festival bottling. As mentioned in our Glen Scotia Double Cask tasting note, Glen Scotia (aka Campbeltown’s other distillery) has seen a revitalization since 2014’s takeover by Exponent Private Equity. They’ve seen new wash backs, a new spirit safe, still upgrades, new roofs, and a visitor center. In 2015, their lineup was updated and this 15 Year Old was released. And in 2016 it will be in the US along with the Double Cask release. Glen Scotia 15 Year Old is all ex-bourbon matured. Judging by the color of it there’s a fair number of first fill bourbon casks in there. Bottled at 46% alc/ 92 Proof without chill filtering. On the nose – Immediately coastal with sea spray and wet seaweed but with a heavy maltiness at the core. Ginger snaps, sandalwood, sweet pipe tobacco and dried lemon peels are all in there, too. Overall – Another cracker from Glen Scotia! We really hope more of the line-up makes it into the US sooner rather than later. Be sure to look for Glen Scotia 15 Year Old on the penthouse floor at Studio450. Glen Scotia (aka Campbeltown’s other distillery) has seen a revitalization since 2014’s takeover by Exponent Private Equity. They’ve seen new wash backs, a new spirit safe, still upgrades, new roofs, and a visitor center. In 2015, their lineup was updated and Double Cask was released. And in 2016 it will be in the US along with a new 15 Year Old. Glen Scotia Double Cask is a vatting of bourbon casks that were finished in ex-Pedro Ximenez casks for 3-4 months and bottled at 46% alc/ 92 Proof. This should be a rich and spicy dram. Our tasting of the new Glen Scotia 15 Year Old can be seen HERE. Overall – Such a revelation! Nose it for a while, taste it for a while, focus on the finish for a while. Then rinse and repeat. The sherry cask influence is unmistakable and so very welcome. We’ll be adding this to our liquor cabinet once it’s widely available in the US. Be sure to look for Glen Scotia Double Cask on the penthouse floor at Studio450. Loch Lomond distillery, located northwest of Glasgow, uses multiple stills (four Lomond stills, two pot stills, and one Coffey/column still) to produce an array of distillery styles with varying peating levels. Loch Lomond Signature and Loch Lomond 12 Year Old will be poured at the Jewbilee along with Loch Lomond Single Grain. Distilled from malted barley using their continuous column still this Non Age Statement single grain whisky is bottled at 46% alc., 92 Proof. Look for it around $30 or $35. Overall – It’s great to see Loch Lomond launch in the US. With a range of distillery styles there’s something to suit most palates and having an affordable single grain to drink all summer long is a great start. Watch this distillery closely. Be sure to look for Loch Lomond Single Grain on the penthouse floor at Studio450. As mentioned during our tasting of Scallywag, we’re honored to have Douglas Laing offerings being poured for the first time at this year’s Whisky Jewbilee NYC. Douglas Laing is a very highly regarded Scottish independent bottler established in 1948. Known for their excellent cask selection they also have vatted malts among their offerings. Today we’re tasting Big Peat, a vatted Islay malt. Big Peat is a multi-award winning vatting of Ardbeg, Caol Ila, Bowmore, and Port Ellen whiskies. Bottled at 46% alc. and non-chill filtered this Non Age Statement offering can be found for between $55 and $65. Overall – A fresh, young Islay vatted malt that doesn’t disappoint. Fans of Ardbeg will love the citrus while fans of Caol Ila will love the coal dust. Fans of Islay drams will love Big Peat. Be sure to look for Douglas Laing’s Big Peat on the main floor at Studio450.